The IT Services National Cyber Security Awareness Month speaker series featured Chad Adams, Cyber Security Advisor (CSA), Region VI of the U.S. Department of Homeland Security, in DSC-D on Wednesday, October 24. CSA Adams presented and discussed various topics related to the National Cyber Security Awareness Month (October), now in its 15th year. UA Little Rock Information Security Officer Veysel Erdag introduced CSA Adams (above), who is assigned to the National Protection and Programs Directorate (NPPD) , a component of the U.S. Department of Homeland Security. NPPD’s goal is to advance the Department’s national security mission by reducing and eliminating threats to U.S. critical and physical cyber infrastructure. 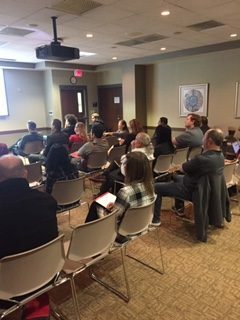 The event was open to the entire campus and was well attended. 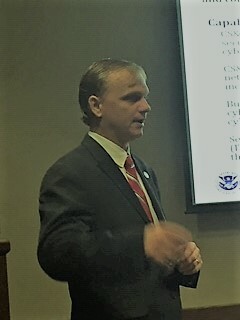 CSA Adams presented an overview of three major NPPD program activities including Cyber Security and Communications, Infrastructure Protection, and Federal Protective Services. In the course of his presentation he shared many interesting case histories and examples of how real is the cyber security threat to the U.S. and the world. His remarks were timely and the audience responded enthusiastically by asking many questions and participating in discussions.